December 4, 2010. 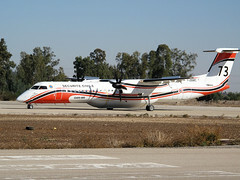 A French fire fighting plane (Bombardier Dash-8) preparing for takeoff on another fire-extinguishing flight from an IAF base in northern Israel. December 3, 2010. 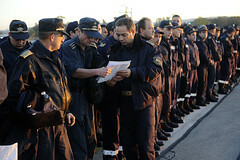 Throughout the day, European support troops landed in Israeli Air Force bases in order to assist the ongoing efforts in the Carmel disaster area. Pictured: Greek planes landing at the Ramat David Air Force Base. Update: Internet Haganah has a link to 'Critical Request for Fire Disaster Relief' at Jewish Agency for Israel if you so choose to help. It would be greatly appreciated I'm sure. Two US Hercules planes carrying 18 tons of firefighting material have landed at Ben Gurion International Airport. US ambassador to Israel James Cunningham who was present when they arrived promised this assistance was just the beginning, saying further aid would arrive Monday including a tactical team. Israeli diplomatic missions in capitals around the world are continuing in their efforts to accelerate international assistance to enable the country to cope with the disaster. 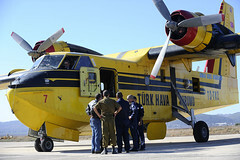 The Ministry of Foreign Affairs has established a situations room with representatives from the Israel Air Force, the National Emergency Authority, the firefighting services and other agencies. Twenty one aircraft and helicopters have arrived in Israel. Of these, thirteen are actively engaged in extinguishing the blaze. Greece: 4 aircraft and an additional Hercules plane for equipment and cargo. Russia: 4 planes, including 1 B-20, 1 YAK which brought in 10 experts and two Ilyushin-67s. EL Al has also flown in fire prevention materials from Marseille. Tomorrow, Sunday 5 December, an additional 3 planes from the US and one from Canada are expected to arrive. The Evergreen Supertanker, the world's largest aerial firefighting plane, was expected to land in Israel on Saturday night and join the fire extinguishing efforts. The American plane, which has a capacity of 80,000 liters of water, is capable of operating in the night as well – as opposed to other firefighting aircraft. 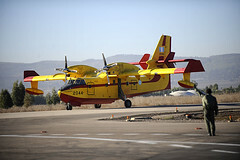 Israel will pay a heavy price - some $200,000 an hour – for failing to purchase firefighting planes throughout the years. Update II: Thanks to Bubbe. Many in the Arab world seem to be happy with the big fire that has been raging in northern Israel over the past few days. Dans les villages arabes du Goush Etzion et un peu partout en Judée-Samarie, l'annonce de la catastrophe nationale de l'incendie dans le Carmel inspire une liesse non dissimulée. In the Arab villages of Gush Etzion and all over Judea and Samaria, the announcement of the national catastrophe of the fire in the Caramel inspires unconcealed jubilation. Un peu partout, les "palestiniens" ont disposé des haut-parleurs géants à l'extérieur pour y faire entendre une musique joyeuse à tue-tête qui parvient jusque dans les villages juifs. Almost everywhere, the "Palestinian" had disposed of the giant speakers outside for them to hear lively music loudly that reaches into Jewish villages. De même, un peu partout, des feux d'artifice sont observés depuis les habitations juives, en deuil national. Well, everywhere, fireworks have been observed since the Jewish homes in mourning. Les Arabes dit "palestiniens "exultent depuis que l'annonce de l'incendie le plus terrible de l'histoire d' Israël a été rendu publique. The Arabs called "Palestinian" rejoice since the announcement of the fire the worst in the history of Israel has been released.